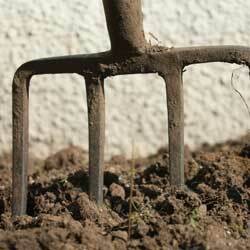 Did you clean, sharpen and store your gardening tools properly last fall when you stopped gardening? Hopefully, you did, but if you didn’t, it’s not too late. Spring is just around the corner, but there’s still time to get these essential chores done and be ready to jump in to all your gardening and landscape work when spring arrives. Round up the shovels, hoes, rakes and picks. 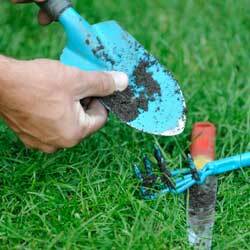 Gather the hand tools such as pruners, loppers, saws, cultivators, weeders and all those little special gadgets you use. If they are all in one place, you can clean and care for them assembly-line style to make the task easier and less overwhelming. Fill a bucket or sink with sudsy water. Combine some elbow grease with some rags, a stiff wire brush, steel wool and small toothbrush and wash off all accumulated mud and dirt. 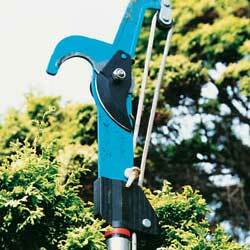 Remove sap from pruners and loppers using rubbing alcohol, turpentine, paint thinner or other solvent. Be sure to clean the handles. Towel dry each tool carefully. How do the wooden handles look and feel? To prevent splinters, lightly sand and apply a protective coating of boiled linseed oil. (Boiled, not raw, as raw won’t dry.) This is also a good time to apply brightly colored rubberized paint to hand tool handles. Not only will this improve the grip but makes it easier to find the tools when Ieft in the garden. If any handles are so worn or damaged that they need to be completely replaced, this is a good time to do so. Get the rust off using sandpaper, steel wool and/or a wire brush. For difficult rust, you may need to attach a wire wheel to your drill. Safety googles are necessary eye protection when using a power tool for cleaning. Afterwards, coat the metal with a thin layer of oil such as WD-40, machine or 3-in-One oil to prevent new rust from forming. 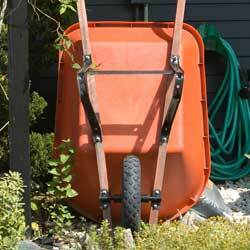 TIP: To prevent rust, make an “oil bucket” and keep where you store your tools. Check the edges and moving parts of the tools. To sharpen shovels, spades and hoes, fasten in a vise and use a hand file to restore the same original bevel angle, usually between 40-70 degrees. Use a fine grit grinding stone along the back edge of the tool to remove the burr created by the file. Wipe the metal surface with machine oil. Don’t forget to sharpen hand pruners and loppers as well, and use machine oil to lubricate the moving parts of different tools. Note: If you aren’t equipped to sharpen your tools yourself, take them to an appropriate expert to be sure they’re sharpened safely and correctly. Now that you tools are ready for work, where will you keep them until spring arrives? Check hooks, stands, toolboxes and other gear where you keep your tools and be sure they are stored safely and securely while still being easy to find and reach whenever you need them. Now, you – and your tools – are ready for spring.